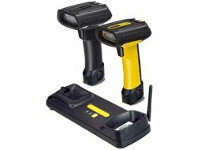 The PowerScan 8000 product series is Datalogic Scanning’s premium line of rugged industrial handheld data collection products. The PowerScan PD8500 corded reader offers omnidirectional reading of 1D and 2D codes as well as the capability of multiple code reading in a single read. Its high resolution Mega-Pixel imaging sensor is capable of outstanding performance in industrial applications. 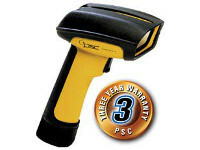 It is offered with three optic models: Standard Range and High Density models are for typical bar code reading conditions (for medium and high resolution code respectively) and the Wide Angle model offers a wider field of view allowing the capture of larger and longer codes as well as a full A4 image capture (29.0 x 21.0 cm / 11.42 x 8.27 in). 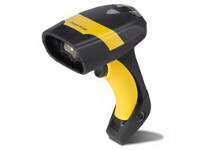 The PD8500 reader features Datalogic’s exclusive 3 Green Lights (3GL™) for superior good read feedback. The patented ‘Green Spot’ directly on the code, and dual Good Read LEDs on the top and back of the cap add increased visibility at any angle. Aiming at the image to be captured is easy and intuitive, with the double-click trigger that enables the Datalogic 5-dot aimer, marking the four corners and center of the reading area. The PD8500 reader’s mechanics have been developed and tested to withstand extreme environmental conditions maintaining consistent reading performance without degrading performance or reliability. Its ergonomic enclosure is lightweight and well-balanced to ensure optimal operator comfort during scan intensive operations. All models have multi-interface capabilities built-in featuring the most popular interfaces; RS-232, Keyboard Wedge and USB. The Datalogic Aladdin™ configuration program provides user-friendly features that simplify the start-up procedure, even for inexperienced users.